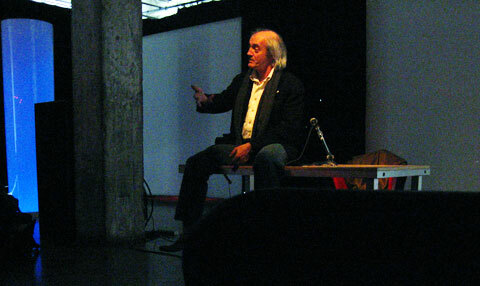 As a grad student I was invited to a special talk by Bill Buxton at SAT on March 25th, 2008. He is a designer and researcher with a music background. The event was an open talk with the opportunity for the audience to come up with questions. It was based in the product design field, but can easily be applied to other design branches as graphic design or architecture. Buxton is a good speaker with sometimes provoking arguments. Daily life examples make his arguments very understandable. Buxton talked about fundamentals of becoming a good designer: One of them is experience. Sketching ideas can help us in the process of getting experienced in a fast and efficient way. Instead of spending time on meticulous, detailed drawings, sketchings allow to move fast on to the next idea. Buxton says that we should forget about 99.9 percent of our ideas. The more ideas the garbage can is filled with at night the most productive employees are. Another important point is collaboration. He brought up the example of the bike company Trekbikes. Employed product designers there are encouraged to use bikes before and during work to be able to experience the client's role and eventually better understand the product's needs and requirements. For a team it is most useful to construct a pool of different experiences. Buxton gave the example that he would never accept a student who would have the same skills as he has. Instead, he would take on a student who has a skill he is unfamiliar with himself. Buxton encouraged students to pick up ideas that are already out in the market and market them. They are not supposed to come up with something totally new. However, if they do so, he warns them to think that an invention is totally their own thing: It still has references in a context of history or culture or environment. It was an encouraging talk based on Buxton's examples from his large authentic professional and private experiences. The university talk was entitled 'The Design Eco-System'. The purpose of his talk was to show how designers think differently.and how they should shape the culture we are in. Buxton himself, Principal Researcher Microsoft Research gave many examples on Apple's designers and their products. According to Buxton the example of Steve Jobs' inventions ot the mac cube show that designers sometimes screw up badly before they come up with a good product. Again, he mentionned the importance of sketching and gave some more details: ''Sketches are like Swiss cheese: They need holes form imagination." An insteresting point was also the type of conversation that should be normal in a design environment: Open and honest constructive critique. Again, this was a great talk with an extended question period. I am curious to get Buxton's book: "Sketching User Experiences - Getting the Design Right and the Right Design" now.